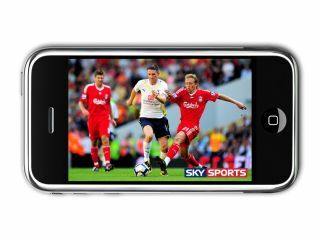 Sky has launched it's long awaited mobile TV app for iPhone and iPod touch, allowing subscribers to stream its television stations through their Apple handsets when they are on Wi-Fi. The Sky Mobile TV News & Sport app will allow people to watch the likes of Barclays Premier League football along with cricket, rugby golf and horse racing. The Sky Mobile TV app will not (as yet) include film or entertainment channels, but does include Sky News, Sky Sports News, all sports channels, ESPN and At The Races. David Gibbs, General Manager for Mobile at Sky, said: "In less than a year we've already seen millions of downloads of Sky's Apps from the App Store. "Our new Sky Mobile TV App combines the demand for great live TV on the move with the high quality viewing experience offered by iPhone and iPod touch. "Sky Mobile TV offers more choice, control and flexibility for customers ensuring they can access the content they want, at a time that's convenient to them, on the screen of their choosing." A subscription to the service will cost £6 a month and people will need a Sky ID; Even current subscribers to Sky will have to pay the fee. The app is currently in the 'featured' section of the App store, and given the popularity of the other Sky apps it's likely to be one of the hot downloads in the coming days.